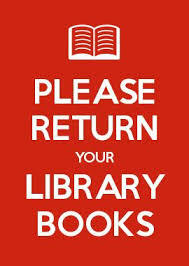 We are collecting all library books in for the Summer. If you have lost the book please provide a fee of £5 so that it can be replaced. This should be given to the school office in an envelope clearly marked for the attention of the Library with your child’s name and class. Please do not hesitate to contact the School Librarian, Mrs Rooney, if you wish to discuss this matter. On Wednesday 5th July we had a very special guest to visit St Joseph’s Catholic Primary, The Worshipful the Mayor of Islington. In order to support literacy in school we encourage our children to join ‘The Summer Reading Challenge’. 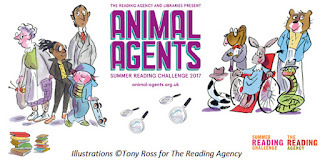 The Challenge is a nationwide initiative run by the Reading Agency. It aims to encourage children aged 4-11 to include reading as part of their summer holiday activities. It runs from July until mid-September. The Mayoress came to our school-wide assembly to launch ‘The Summer Reading Challenge’ along with two of our local librarians from Archway Library. The children were shown a short fun film made by the Reading Agency about the challenge. The Mayoress and the librarians talked to the children about how it is important to keep reading over the summer and told the children all about how to join-in. This year’s theme is ‘Animal Agents’ and everyone who joins-in has a chance to solve a mystery and catch a crafty crook! · Read 6 books pick up your rewards and you might even win a prize! 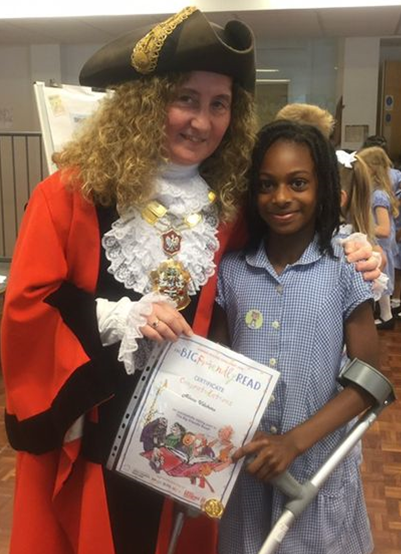 The Mayoress also presented certificates to all those children who participated in last year’s Summer Reading Challenge. Well done to all those children! Let’s hope we get the whole school reading this summer so that we will need a bigger stage for the presentation next year! REMEMBER to join in all you need to do is go along with your child to your local library to register and next year they will be part of our special school assembly to celebrate our fabulous readers! Archway Library will be at our Summer Fair on Friday 14th July when you can register your child for the challenge. An Invitation card with details of the challenge will be sent home. 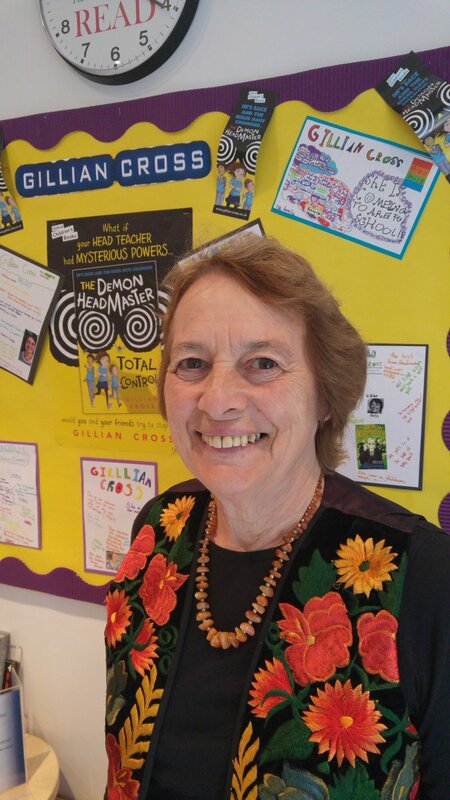 St Joseph’s Catholic Primary were lucky to be selected to host the recent ReadingZone Live event with award-winning author, Gillian Cross (The Demon Headmaster, Wolf, and Shadow Cat), on Wednesday 28th June. 20 children from Year 5 participated in the video conference which was filmed live from our school. Gillian Cross talked about her inspiration for writing and took questions directly from our children and from Cheam Farm Junior School children in Sutton via video conference. 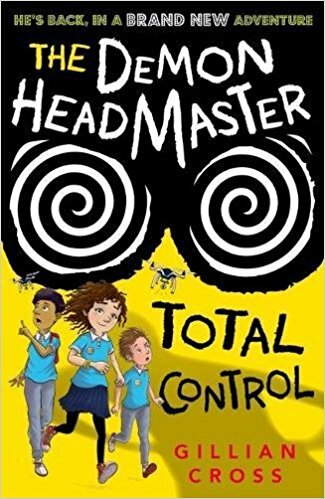 In preparation for this event our children had been reading and enjoying her book ‘The Demon Headmaster’ during their library sessions. They had also created posters on the author’s life and works that Gillian was delighted with. Some of them are on display in the Library. 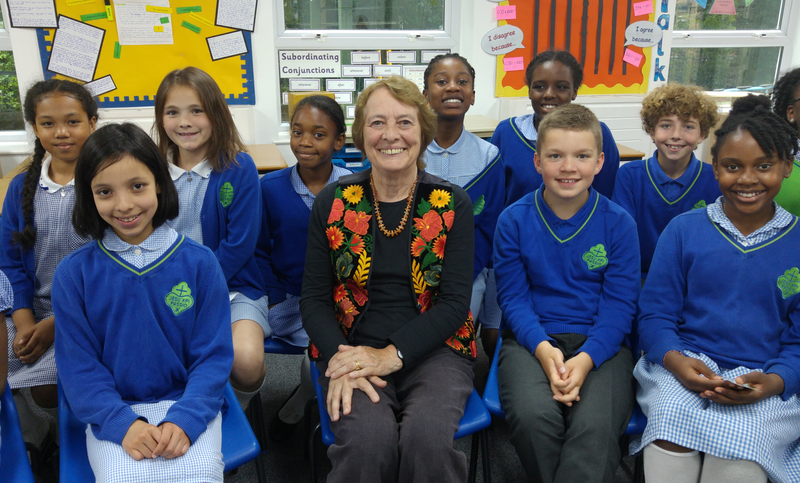 The team from London Grid for Learning (LGfL) and ReadingZone commented on how “immaculately behaved” our children were. They showed incredible concentration and asked lots of intelligent questions. “They were a credit to the school”, the LGfL team said. We hope that this is the first of many such events as they contribute to improving literacy and inspiring our children. We have many of Gillian Cross books in the Library. Come along and borrow one. Thanks to the LGfL and Reading Zone teams for making this possible.